There is a place where my husband would probably spend each and every lovely summer evening given the chance — sitting by a campfire. It can turn the longest day into the longest night for him, it is the second wind he needs after exhausting hours of daylight labours. Despite being tired, when he gets that backyard blaze started, he will sojourn there well past lights out once it's going. Completely understandable of course. 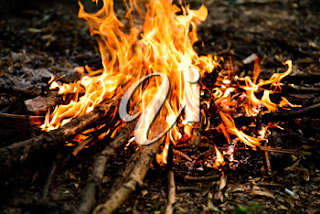 Not only is there something completely mesmerizing about the snap and crackle of burning wood, the dancing colours within the flickering flame, but some of our best times with family and friends have been around a summer campfire. There are fond memories of nights at our summer place years ago, laughter and stories, roasted dogs and brews filling the space between dusk and when we would finally yield to exhaustion and call it a day. While we've enjoyed many a great night socializing or just relaxing around a campfire at home too, there was one particular one that holds a special place in mind and heart. Our grown children, along with some surprise guests, had been visiting one day and decided to stay. As they all live fairly close (just not close enough for Mom) this was a rarity. We capitalized on the situation by having a campfire. It was a great night which, while enfolding, I did my best to photograph. Problem is, that's a bit tricky. The black of night surrounding lively people with smiling faces, who in turn are surrounding the intense light of a fire, can create a situation that requires a bit of expertise, something I was sorely lacking. As a result while I managed to capture the moments for posterity, none were quality. Now I wait for another one of these occasions to simply happen so I can try my hand at it again. Thanks to these tutorials I'm feeling far more confident in the results.